DevonAgent is billed as an Internet research tool that happens to include a Web browser. But you could also think of it as a Web browser with advanced research features. Either way, it combines a reasonably full-featured browser with a unique method of searching for information online. Because DevonAgent uses Apple’s WebKit engine, the pages it displays generally appear just as they do in Safari. But DevonAgent offers several additional neat tricks. For example, if a Web page is not in your computer’s default language, you can click a flag icon in the toolbar to fetch a translation from Google. You can also save workspaces—sets of browser windows and tabs—and restore them with one click. DevonAgent can store the contents of Web pages for offline viewing or searching, either in its built-in archive or by sending the pages to DevonThink, its companion organizing tool. DevonAgent takes a novel approach to Web searches. First you select (or create) a Search Set, which includes parameters such as the search engines you want to consult and the specific elements you want to look for or exclude. You can create sophisticated searches that include Boolean operators (AND, OR, NOT), proximity terms (BEFORE, AFTER, NEAR), and other criteria. When the search is finished, DevonAgent displays a relevance-ranked list of terms applicable to your search and summaries of matching pages. You can automatically repeat any search on a schedule to identify new information as it appears online. All of this thoroughness takes time, however—count on several hours for a fairly detailed query. (And, in my testing, DevonAgent’s searches sometimes hung partway through, forcing me to restart them.) This was extremely annoying, as sometimes hours would elapse with no indication of progress. The developer acknowledged this issue, but did not offer a fix. 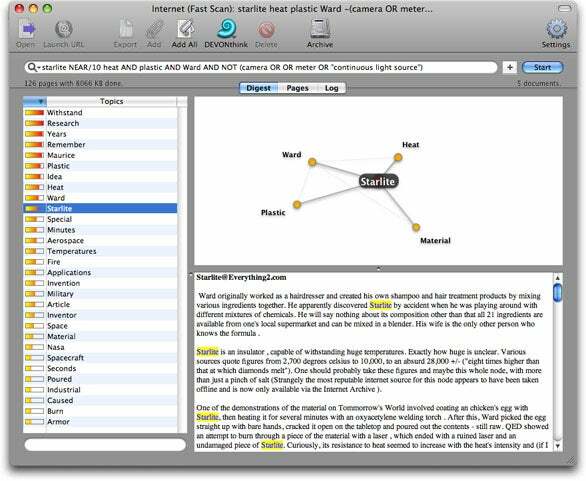 You can construct fabulously complex searches in DevonAgent; the results include a relevance list, a map of connected topics, and page summaries. If your Internet research needs go beyond the simplistic results you can get with the likes of Google, you’ll find DevonAgent’s unique search tools to be invaluable—when they function properly. However, as a Web browser, DevonAgent 2.3 is below average in terms of functionality and stability. Stick with Safari or another free browser for standard Web surfing, and use DevonAgent only for what it does best.